​The Second Church Estates Commissioner (Dame Caroline Spelman): The Church of England was very concerned by the judgment of the European Court of Justice that stated that blanket bans on the wearing of political, philosophical or religious signs do not amount to cases of direct discrimination, because that conflicts with the pre-existing rulings of the European Court of Human Rights. By leaving the European Union, we presumably stand some chance of resolving such inconsistencies. Sir David Amess: Does my right hon. Friend agree that this is yet another reason to be pleased that last year the British people took the decision to leave the European Union? The ruling was deeply offensive to people of all faiths and totally unnecessary. That is what we should be able to do if we can resolve this inconsistency. The Second Church Estates Commissioner (Dame Caroline Spelman): I must pay tribute to my hon. Friend for his long-standing support of the institution of marriage. I am very pleased to tell the House that, since he last asked this question in 2011, the Church of England has launched the successful new initiative, “Your Church Wedding”, which is designed to increase the profile of church weddings, highlight the possibility for those seeking to be married, and offer more consistent marriage preparation and aftercare. Andrew Selous: I am very grateful for that answer, but the fact is that marriage rates have unfortunately declined in recent years. I know that my right hon. Friend will agree with me that there is nothing inevitable about that, given that for a decade, between 1962 and 1972, they rose. As this is a real social justice issue, with the ​decline in marriage rates having a particularly significant impact on lower-income families, will the Church appoint a bishop to promote healthy marriage, with the aim of spreading best practice in every single parish across the country? Dame Caroline Spelman: I genuinely believe that this new initiative will spread best practice. I am sure that all bishops regard themselves as a bishop for marriage. However, there is no doubt that there has been a decline in church weddings, and that is in part due to the fact that there has been liberalisation of the legislation around where couples can get married. None the less, we should celebrate the fact that they want to get married. I will finish with one good new trend: women over 65 are getting married in increasing numbers. Mr Speaker: It is always useful to have additional information. We are most grateful to the right hon. Lady. Dame Caroline Spelman: The number of people selected for training for ordained ministry within the Church of England has been stable for some time. However, the age profile of serving clergy means that larger numbers are retiring, leading to an overall decrease in the number of active clergy. The Church seeks to address that by increasing by 50% the numbers training for ordained ministry: an increase from about 500 to 750 by 2020. Sir Desmond Swayne: That is an A* answer, but how can we do even better? Dame Caroline Spelman: Quite simply, we need to make it easier for people who feel the call to enter ministry to do so more flexibly. The Church offers not only a three-year residential course to become an ordained minister, but part-time peripatetic provision. As a result of the apprenticeship levy, resources will be available to the Church for people to learn on the job. That should make it a whole lot easier for people to enter ministry. Mrs Anne-Marie Trevelyan (Berwick-upon-Tweed) (Con): Does my right hon. Friend believe that the number of vocations would be improved if the Church of England did more to protect its churches in Northumberland from metal theft, which leaves young ordinands with a lot of logistics to deal with when they should be focusing on their parishioners? Dame Caroline Spelman: I must congratulate my hon. Friend on her ingenuity in raising the very important and serious matter of metal theft—an ordained minister cannot practise without a roof on their church. This is a serious problem. The Church of England offers guidance, and I refer hon. Members to the ChurchCare website. There is a range of metal substitute products that can be used even on listed buildings. Currently, there is a pilot system for marking lead, which is designed to help scrap metal dealers so that they can identify when stolen goods are being presented to them. This is a ​serious matter, and we are working closely with Government Departments to try to make it harder for the criminals to impede the desire of those who wish to minister in the Church and to make sure that the roof stays on. Marcus Fysh (Yeovil) (Con): I welcome that news, and the initiatives on raising the number of clergy vocations. Stealing metal from church roofs is indeed an unfortunate vocation. What are we doing in the Yeovil area specifically to stop such theft? 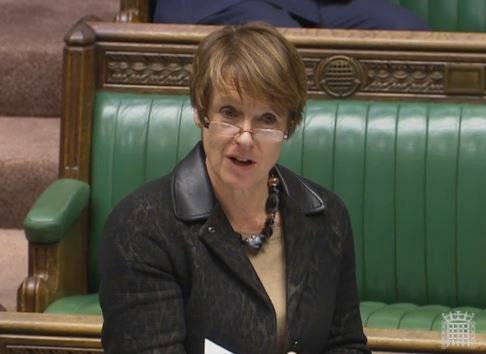 Dame Caroline Spelman: I do not have information on Yeovil specifically, but advice is available on the Church’s website for every diocese—unfortunately, every diocese is affected by this serious crime. In addition to the deterrents I outlined in my previous answer, there is a system for fixing or locking lead—perhaps I should not give it away in the House, because then the criminals will know about it. It is pertinent to my constituency, where that system was used after the second theft of lead from a church roof. The deterrence means that even in the dead of night it is possible to catch evidence of the crime taking place. I recommend the Church’s website. Dame Caroline Spelman: As this is likely to be the last question today, Mr Speaker, please allow me to congratulate the parliamentary unit of Church House on the splendid way in which they have briefed me throughout my two years as Church Estates Commissioner, for none of us can be complacent about returning to our existing posts after the general election. This is a serious question. The Church of England and the offices of the two archbishops are in regular contact with the Church in Egypt, South Sudan and Nigeria directly through the Anglican Communion Office. They are most concerned about the recent attacks in Egypt, where on Palm Sunday 44 people died at St George’s church in Tanta. Diana Johnson: The 2017 World Watch report by Open Doors states that persecution increased for the fourth year in a row during 2015-16, with murders of Christians in places such as Nigeria and Egypt, as the right hon. Lady mentioned. What practical measures can the Church offer to communities in such countries? Dame Caroline Spelman: I attended that Open Doors event here in Parliament, where a Nigerian pastor spoke movingly about the violent persecution of himself and his congregation in northern Nigeria. With regard to Egypt, I am pleased to say that Bishop Mouneer has secured intensive security measures for the Christian Church in Egypt, including emptying the streets around churches and cathedrals of cars, and putting extra police on duty to protect worshipers before services begin. Mr Philip Hollobone (Kettering): To ask the right hon. Member for Meriden, representing the Church Commissioners, if the Church of England will take steps to support initiatives which provide indebted households with financial breathing space. Dame Caroline Spelman: The Church of England supports the Breathing Space campaign of The Children’s Society and StepChange. The Church has considerable experience of supporting people in financial difficulty and has for the last four years been actively promoting credit unions and financial education within its school and church networks. • ideas for engaging parents designed to give children a practical experience of handling money and ensure that positive messages about money are reinforced at home. Oliver Colvile (Plymouth, Sutton and Devonport): To ask the right hon. Member for Meriden, representing the Church Commissioners, what support the Church of England provides for people affected by domestic violence and abuse. The updated practice guidance and policy encourages churches to become places of safety where domestic abuse is taken seriously, survivors are believed and respected, and alleged or known perpetrators challenged. The updated document reflects legislative and other changes since guidance was last issued in 2006. Under the policy Church leaders and Officers working with children, young people and vulnerable adults will be expected to undergo domestic abuse training, with the issue being raised in appropriate contexts within church life including youth groups, marriage preparation and ordinand training. They will also be expected to work closely with statutory and other specialist organisations. In the House of Lords this session bishops supported the passage of the Preventing and Combating Violence Against Women and Domestic Violence (Ratification of Convention) Bill. Alan Brown (Kilmarnock and Loudoun): To ask the right hon. Member for Meriden, representing the Church Commissioners, what the policy of the Church of England is on reducing the membership of the House of Lords. Dame Caroline Spelman: In December the House of Lords passed a motion that its size ought to be reduced. The Bishop of Birmingham, who is Convenor of the Lords Spiritual, supported that motion and has since made a submission to the Committee set up by the Lord Speaker to look at options for reducing the size. Its report is awaited. For many years now the public responses of the Church to proposals for Lords reform have highlighted the problem of the Second Chamber being too large and have called for action to address it.